Well, when Byakko is hungry, he tends to chew on the first edible-looking thing he finds (I would know), so we have indeed reviewed the first page offered up to us, and it looks pretty tasty! My review is going to be short and sweet today -- this is a good shrine page, well-designed, and practicing excellent etiquette in many ways. What's to be nervous about if you have gone to the trouble to make sure that your page is a good one, ne? 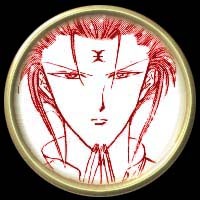 The Fushigi Yuugi Hotohori Shrine has a clean, simple design, pretty graphics in colors that are gentle to the eye, the graphics suit the subject of the page, and when loading it in lynx, I didn't see one obnoxious [INLINE] tag where an image with an alt tag should have been! Hooray! Images are generally ones that I'm pretty sure I saw there first (this is a page that's been around for a while). As for information, I disagree with Seiryuu that the page necessarily needs a lot of info, or even a little info, about other characters and other parts of FY. It's a character shrine. She links to an excellent FY link directory where people can find out more about the anime; perhaps a quick mention of what the show is would be useful, but otherwise, a shrine is a shrine. It's nice self-contained. The information about Hotohori himself is good, and it's wonderful that Tasuki no Miko, whose manga profile translations are so often filched without a word, is credited... but shouldn't there be more? We've all heard fangirl after fangirl wax eloquent about the beauties of their favorite bishounen, surely there could be more about Hotohori's life and feeling here! He is one of my Seishi, after all. There is, however, a lot of other fabulous and unique stuff on the page! A poem, written by Maxi Rose herself, a MIDI of Hotohori's theme music (again, created by Maxi Rose, and not from sheet music either), and some cosplay pics of herself, her husband, and friends make the page well worth visiting, and she's also founded a Hotohori Mailing List which you can subscribe to from a form on the page, and a story-RPG called Fushigi Soudan which is quite popular (I'm not a part of it myself, too busy looking after that Miko of mine).